I'm not sure if we should continue using it as someone has posted a comment that Playfish will ban cheaters. Although it's not something new, they are usually not that strict. Even then, I would like to remind everyone that there is ALWAYS a risk when you cheat (read my disclaimer). I can only be deeply sorry if you are unlucky enough to get banned (which I sincerely hope wouldnt happen). Remember this, if you are banned, you will NOT be able to access ALL playfish games again. If you are afraid, I would recommend that you stop usage of the cheat immediately. For those of you who had edited till extremely large amounts, I can only hope that you will not get detected. My version has been extremely tame and if you had not been greedy (millions/billions of coins/exp) , you should be safe. download above required files. Either with exp cheat or without. You decide. Just sell away the Round Rocks that everyone is given at the start of the game. 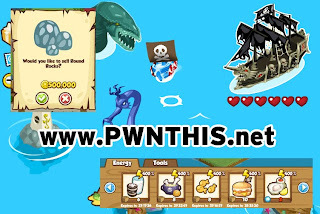 You will get 500,000 coins instantly. If you want more coins, just disable fiddler, clear cache, reload game and purchase more of such Round Rocks at a cheap price. Then start the cheat again and sell them at 500,000 coins each. I have set all items to replenish 4 times your normal energy. It should be more than enough. Fight sea monsters. Lose to them and you get 2k instantly. It random, so you will only level up when you lose. Which is good so that you dont lose the fun so soon ;p And also cause it's not possible to gain large amounts of exp by winning. 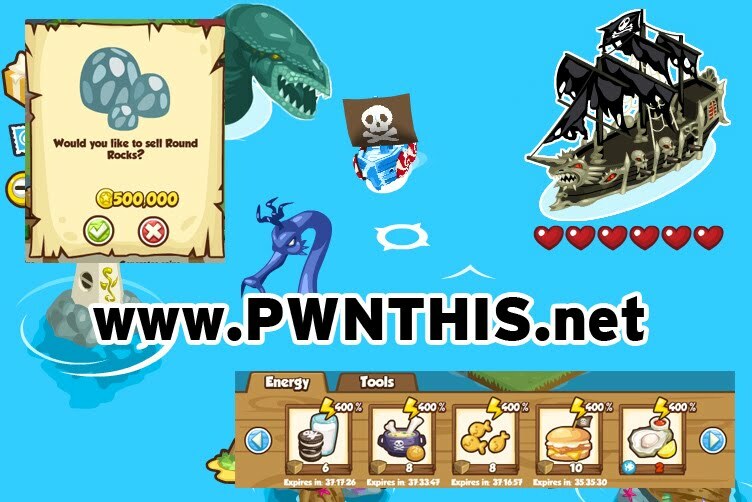 Have fun with your Pirate Ahoy Cheats! If you want to edit your own database, use this Decompiler which im using for Pet Society.